As a small-business owner, you can’t afford to be taking losses because of theft, including shoplifting. Even a small amount of shrinkage in your profit-and-loss statement could mean the difference between taking a loss and breaking even. Because you can’t afford very many losses, it’s also likely that you can’t afford expensive or high-tech solutions to help you reduce the risk. According to one security installation company, you can reduce theft by having convex or dome mirrors installed so your retail employees can “keep an eye” on the store, right from their registers. Look at a simple scenario that might describe your dilemma. You own and operate a small store and need to reduce theft-related losses. Any method you choose to use has to be reliable without being so expensive it breaks your operating budget for the next two business quarters. The solution doesn’t have to be very high-tech. Call a security installation company and they will send a representative to your business, look at your setup and help determine what will best help cut down shoplifting. You do your best to hire only the best employees. You check resumes and request background, credit and criminal checks, but someone will slip through. Soon after, you notice varying amounts missing from the till count at the end of the day, for several days or weeks in a row. 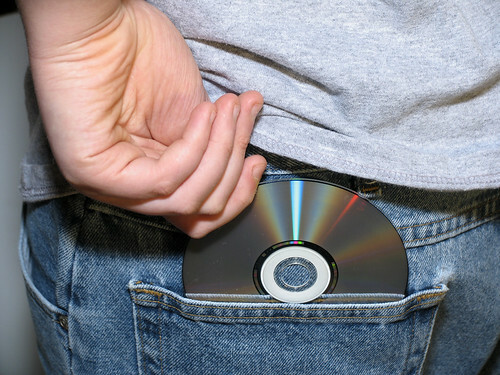 As a small-business owner employee theft can be more devastating to your profit than shoplifting. For this, a convex or dome mirror, combined with a second solution, such as surveillance cameras, might help you to identify the dishonest employee and take fast action. 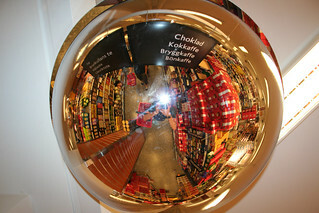 The convex mirror can cover a wider area than a flat mirror can. 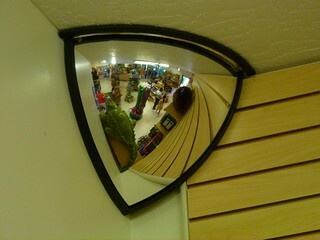 Small stores, convenience stores and larger retail stores all rely on the installation of several convex mirrors that have been strategically placed as they work to cut down on different types of theft. These mirrors increase visibility in blind-spot areas where you have suffered stock losses. If you’re losing stock in the stocking area, a few convex mirrors can help you and your supervisors catch theft as its happening. Take a small field trip and visit stores or the hospital so you can see how a dome mirror works after it’s already been installed. Of course, you’ll need to explain what you’re doing so you won’t get tossed out. Other small-business owners will understand what you’re doing when they see you standing at a distance, looking at traffic that’s reflected in one of their dome mirrors. Look closely at what you see happening reflected in the mirror. It picks up traffic that’s approaching from other hallways and doorways, people passing directly in front of it and traffic moving away from its catchment area. If you have experienced stock losses in one part of your store, a security specialist will recommend installing a dome mirror close to that area so you can be standing at a distance and still catch the shoplifting as it’s happening. Part-time blogger Claire Taylor is a loss prevention manager for a major retail chain. She suggests checking out http://www.mirrorpros.com for solutions to hidden areas of your store, not just for theft but also safety of employees and customers. Employee theft is a very serious issue for small business enterprises such as, small self storage companies, moving companies, etc. To come over this problem you need to satisfy your employees too,, you should be rewarded them for their good work.